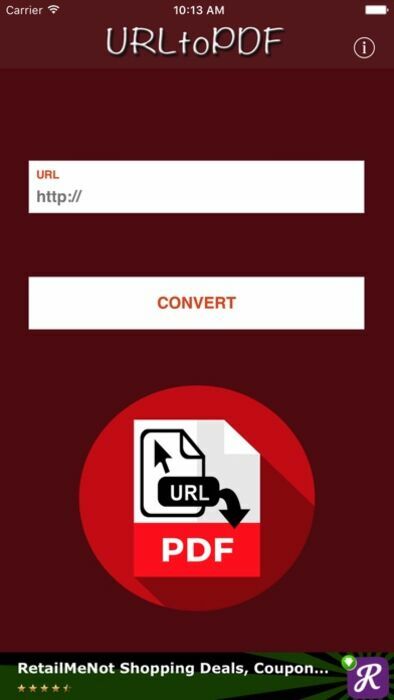 Convert any URL / Webpage to a PDF. Then have it sent to your inbox instantly. IMPORTANT: Due to heavy converstion volumn you may sporadically not receive your converted PDF, if this happens please try again. We are working to resolve this issue. FEEDBACK: I will continue to improve this app with free and frequent product updates including new features. Therefore I would like to know all your suggestions or any bugs you may encounter. SUPPORT: If you're experiencing any problems at all, please contact me at support@jasoncheeks.com, @JCMobileApps via Twitter, or http://www.facebook.com/JasonCheeksMobileApps via Facebook before leaving a bad review. Optimized and redesigned for iOS 12 and updated logo.